Vapers are more prone to suspicion than the average member of the public. As former smokers, they were the victims of subterfuge and duplicity at the hands of big tobacco. But could wild-eyed theories of government collusion with academia, public health interest groups and the media in an effort to kill vaping, be true? The answer appears to be yes and the details are not pretty. In this episode of RegWatch Michelle Minton, Sr. 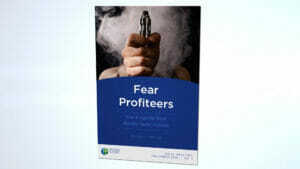 Fellow from the Competitive Enterprise Institute and author of the exhaustive report “Fear Profiteers: How E-Cigarette Panic Benefits Health Activists,” pulls back the curtain to expose the motives and tactics behind the public health war against vaping. Brexit Irony – Dashed Hope for UK Vapers?